Travelled through various cities in India and atlast ending the journey in the city in which it evolved, The Blue Mug play had its last show in Rangshala on evening of 7th of august. I was among those few lucky enough people to see and appreciate the beauty and truthfulness of the play. 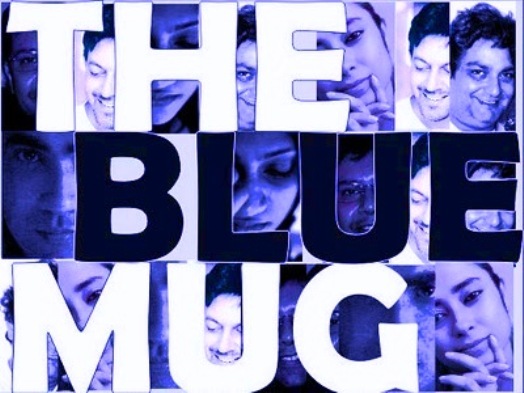 “We are what we forget,” says a character pensively towards the end of Atul Kumar’s directed and refreshingly enjoyable and engaging play, The Blue Mug. The play stars Munish Bhardwaj, Sheeba Chaddha, Rajat Kapoor, Vinay Pathak, Konkana Sen Sharma and Ranvir Shorey. Through bilingual – Hindi and English – monologues the actors, playing themselves (except Sharma and Shorey), re-construct themselves from their earliest memories to the present day in a rich tapestry of stories that questions the very concept of memory and does it primarily on the strengths of the actors’ performances. Inspired by Oliver Sacks’s essay, `The Man who Mistook his Wife for a Hat’, actors in The Blue Mug, struggle to construct themselves on the basis of what they remember, bringing up all those moments, both significant and irrelevant, which they salvage from the abyss of forgetting. They present themselves as they are, trying to sift truth from the fiction of their pasts. Kapoor kicks off the reminiscing by describing family gatherings centered on the bhutta (corn on the cob) where no one would worry about the digestive consequences of the day after. Chaddha talks about the beach, where she would collect remnants of glass bottles that have been worn by the sea into beautiful round pieces of shimmering blue and green. Pathak recounts the numerous times he was taken to the circus and the one embarrassing incident where a clown laughed at him in his face. Bhardwaj recalls his years in an all-boys convent school and “all the things that happen there.” As the monologues move closer to the present, the actors share increasingly personal vignettes, connecting pieces of the puzzle to provide a fuller picture of themselves. Well, but the man who stole the whole show was Shorey(the opinion being strictly personal). The Sharma-Shorey track strays from the abstract structure of the rest of the play. Their storyline is dominated by Shorey who clearly has the meatier chunk of the two and, with a perfected Punjabi twang, delivers an astounding performance. The highlights of this sequence are when Shorey describes his family history (how they got into the business of selling fish), and later when he meets his brother after twenty years. It’s hilarious and heartbreaking at the same time. The Blue Mug has no set to speak of – just large chalkboards hanging from the ceiling on which the actors scribble key signs from their upbringing – and no costume changes. The focus is, therefore, entirely on the acting and how well the actors string it all together. But the small things like the sound of hopping of Chaddha while Kapoor describes his father’s death and the pace at which it increases as the emotion of the situation deepens and four of the actors repeating same dialogue again and again with increasing anger and intensity are really remarkable. If you are wondering why it’s called The Blue Mug, there’s no specific reason other than that it is an element of one of the actor’s memories. It also means that the play could have literally been titled anything else, depending on how you would want to remember it. That, essentially, is the point.